Unique and artist-owned, we are an Art for Hospitality Program that constructs tailor-made and ready-to-hang collections directly from the studio. Hotel guests of today expect certain levels of style, relevance, and ambiance from a hotel. Guests want more than just a place to stay - they want immersive social, cultural and visual encounters that transport them to a higher state of mind and wellbeing. 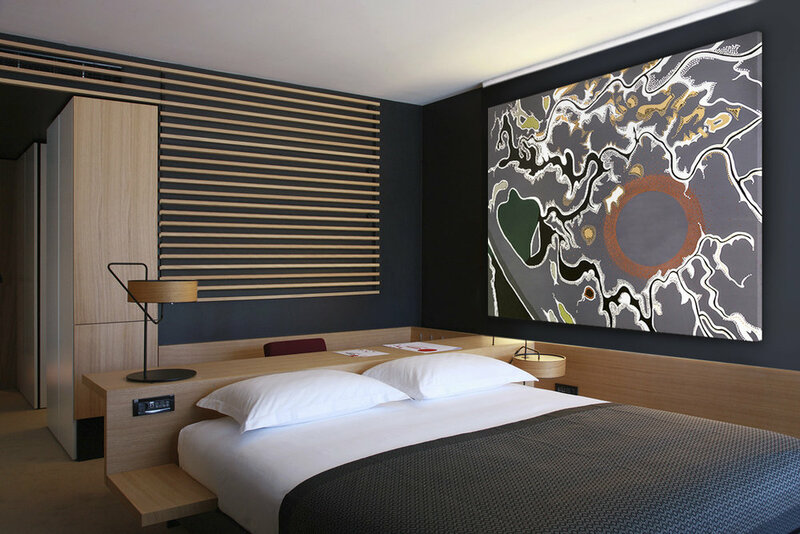 Steiger Art is an art for hospitality program at the forefront of the demand among hotel guests for authentic and compelling experiences and environments when they travel. The program provides curated collection of original paintings, lithographs, and fine art reproductions as a unique way to introduce contemporary and cohesive art into the personality of a hotel. The program includes a number of carefully selected series from artist Merrill Steiger's vast collection of original works. Each series reflects a unique aura, energy, and aesthetic. Combining diverse palettes, imagery, and techniques, Steiger’s work is both contemporary and timeless, lending itself to be both accessible and engaging to all audiences. Our fine art for hospitality program provides high value, contemporary relevance, and stirring ambiance to hotels at a competitive price. Through a malleable and transparent pricing model and wide range of fine art products, we tailor a unique selection of works to enhance the quality of the hotel guest’s experience. Our production network includes the highest quality manufacturers and materials New York City has to offer. Steiger's pristine original works are all museum grade, ready-to-hang acrylic paintings on hand-stretched cotton duck canvas with wrapped and painted sides, staple-free edges, archival quality priming, and solid wood, warp-resistant frames. These archival quality works endure the effects of time and retain their splendor, saturation and value indefinitely. Our lithography editions are hand-printed by renowned printmaker, Maurice Sanchez of Derriere L'Etoile Studios. Founded in 1978 with the help of publisher Brooke Alexander, Derriere L'Etoile Studios has worked with such artists as Jennifer Bartlett, Donald Judd, Robert Longo, James Rosenquist, Jeff Koons, and Kara Walker, to name a few. The Studio yields hand-made editions of archival and museum grade lithographs, produced with the highest quality papers, print surfaces and ink. Each lithograph is hand numbered and signed by the artist so as to validate its authenticity and originality within each particular edition. Available in sizes up to 40 inch single sheet prints, our lithograph designs are made to order in the edition size of your choosing. Singular or small editions are available upon request depending on our current stock.